When personal financial management (PFM) tools first started weaving their way into the banking industry, both consumers and financial institutions alike struggled. Consumers didn’t fully trust and understand PFM, while banks and credit unions wrestled with how such tools fit in their product mix and how to market them. As a result, adoption rates for PFM languished. Today, nearly every aspect of consumers’ financial lives has migrated to digital channels. People desperately need online and mobile PFM tools that can keep up. Someone has to break the spell that bad PFM experiences of the past has cast. 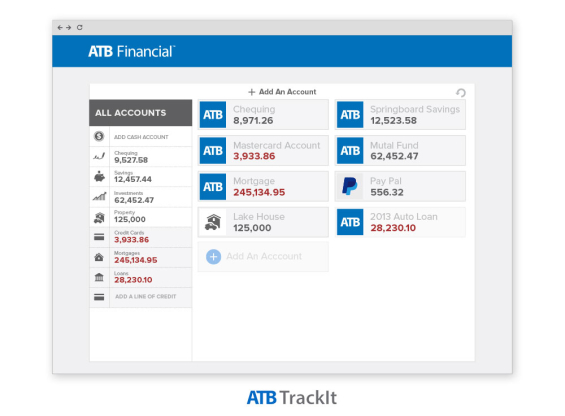 “What it comes down to is that people need advice, but they don’t seek advice,” says Rita Sly, managing director of channels at ATB Financial, a Canadian regional bank that successfully launched their TrackIt PFM tool from MX. She says it’s great when people waltz into a branch because then it’s fairly easy to connect them with a personal banker (if you have one)… but that rarely happens — at least nowhere near enough. 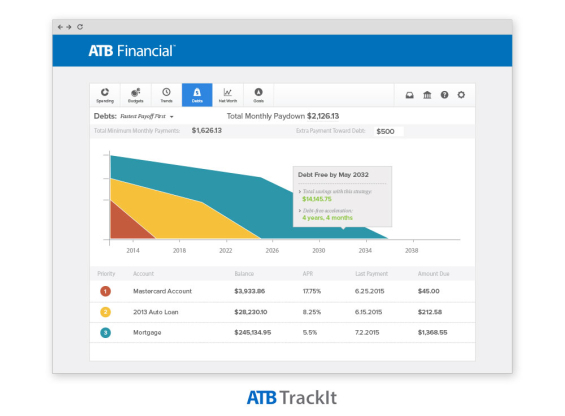 Ms. Sly must know what she’s talking about, because it only took ATB six months since launching TrackIt in December of 2014 to get 46% of their online banking customers adopting their new PFM product. Gardner’s PFM philosophy is pretty straightforward. He believes a good PFM solution should do the heavy lifting for users — make life easier. So the development team at MX threw themselves at a critical component in consumers’ PFM experience: ensuring that user transactions are automatically categorized with precise accuracy. It may sound simple, but Gardner swears this is the trick. Once that’s in place, Gardner says it’s unbelievably easy for users to auto-generate budgets — and continue managing them. “Once end users pull in all their accounts and see their spending effortlessly organized for them, they stick with the product,” Gardner says. Not so, Ms. Sly cautions. To explore innovations within the industry and ferret out disruptive threats facing their bank, ATB Financial created what they call the Emerge Group. This special intelligence squad makes recommendations to senior leaders throughout the organization, explaining which ideas are worth pursuing… and which ones aren’t. The Emerge Group loves disruptive topics. They’ve investigated everything from crowd funding to collaborative savings plans, but it was ultimately PFM that ultimately stood out. The Emerge Group didn’t see PFM as a disruptive threat, it seemed to have real potential. For starters, PFM wasn’t a technology prevalent in Canada at the time. Despite ATB’s success with PFM, Sly says there are still doubters. Now of course, calculating the ROI of anything is tricky, and PFM is no different. 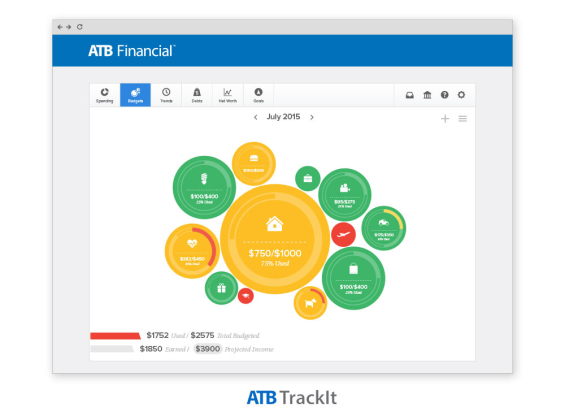 But ATB says the decision to offer TrackIt was based on a desire to help people improve their financial health. “We’re here to make banking better for people and make their lives richer, and this was the tool we needed in order to do that,” explains Sly. According to MX Training Director Erin Caldwell, PFM users are often the most engaged, the most loyal and most profitable account holders. In both the U.S. and Canada, it’s common for consumers to have one relationship with a big bank and another with a second bank — a smaller regional bank like ATB. Caldwell says these secondary institution’s can use PFM as a lever to pry consumers away from big banks, and Ms. Sly at ATB Financial agrees. As Sly and the ATB team watch PFM adoption rates soar, they are also looking for any potential increase in share-of-wallet over the next 12 to 18 months. The fundamental theory they are testing? That more customer engagement increases, the greater chances are that you become their go-to resource for financial services. 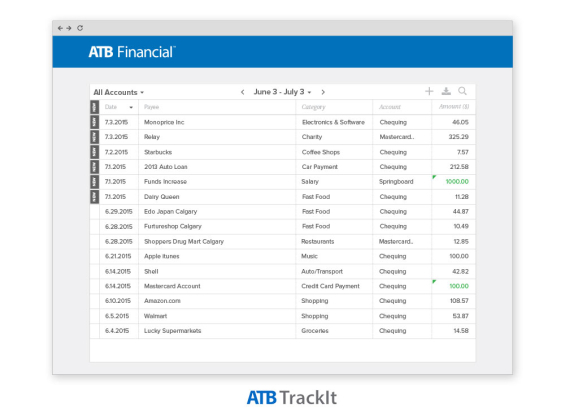 ATB plans to figure out if TrackIt has changed consumers’ behaviors. Are they paying more bills with bill pay? Have they opened more products? “We’re now at the point where a considerable pool of customers are using TrackIt to do a deep dive analysis of their financial picture,” says Sly. With a little analytics wizardry, PFM data can be leveraged to target customers with product offers specifically geared toward their needs and situation. For instance, if someone repeatedly classifies transactions as a “Child Expense,” it’s safe to assume they probably have children. Drawing assumptions like this, many banks have seen success from cross-selling services, with click-through rates on targeted offers like these averaging 25% — a big leap from 7.6% untargeted. David vs. Goliath: Is PFM the Slingshot Banking’s Underdogs Need? One of the major reasons for this shift is that big banks have more resources and can invest earlier than others, specifically where technology is involved. Consumers are also more prone to look outside of banking altogether. According to data from MX, 20% to 25% of people today use digital tools to manage their finances, and of those people, about 75% are using third-party tools such as Mint.com. Rachael Schwartz, electronic marketing specialist for Farmers Bank & Trust, has also launched the MX white label PFM tool, which they branded Clarity. Schwartz says rolling out PFM was essentially a matter of survival. 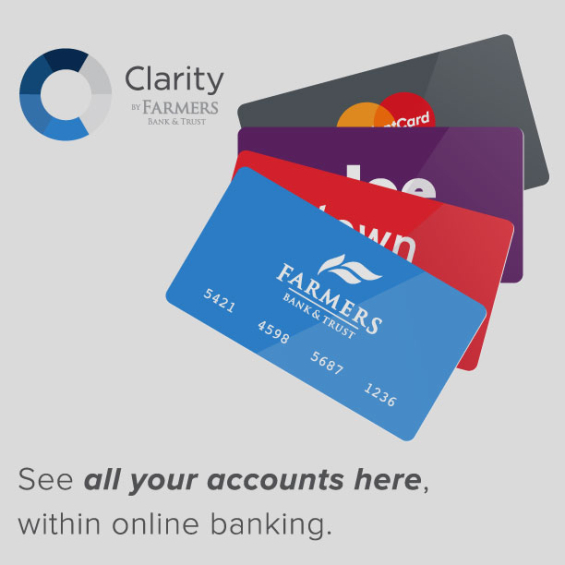 Farmers Bank & Trust launched Clarity in the beginning of 2014, and — like ATB — saw an almost-unbelievable adoption rate. By April, they were already at 40% and soaring higher. Impressive, considering the historical adoption rate for PFM has normally hovered around 8%. For every transaction, the tool automatically assigns a category, and you can adjust any categories or add custom ones. As you fine-tune the transactions, TrackIt learns your behaviors and gets even more efficient over time. The spending wheel shows spending habits in a different view, where you can look at an overview, or click a category to see details of each spending category. 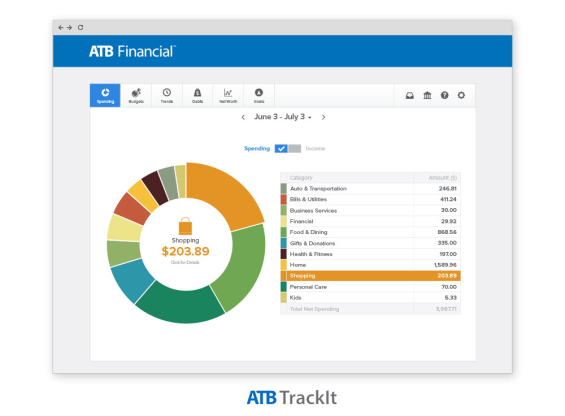 TrackIt also has an auto-budget feature that uses past transactions to create a custom budget based on that past spending. The user then simply alters the budget to reflect how they would like to start spending in that category. The size of the bubble is the relative amount of the budget, and the color shows if you’re on track or not. For marketing on the bank’s site, TrackIt was promoted as a free upgrade, including a video that explained to customers what the tool does and how to use it. From there, the customer could say yes or no to trying it. For those that said no, the bank continued to put the teaser breadcrumbs throughout the traditional experience offered. Customers would be prompted with messages like, “ever wonder how your spending adds up?” If they click on it, the customer ends up back at the free upgrade page. 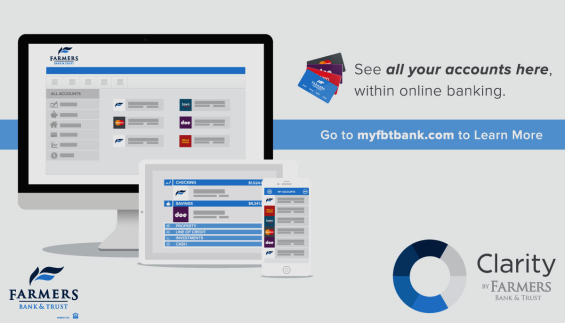 For instance, the bank hosted an online launch event for an audience of financial bloggers and customers, where Sly took the stage to walk through the features and functionality of TrackIt and explained why they chose to offer the PFM tool. You can view the recorded event by clicking here. 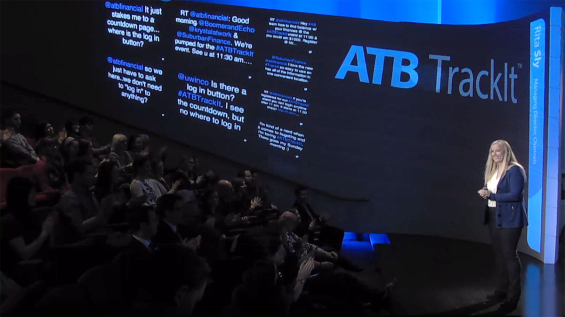 ATB also used Blippar, an app that uses technology similar to QR codes, but instead allows users to scan a graphic image instead of a plain, black-and-white bar code. The bank created coasters and posters that were placed in pubs throughout Alberta. When a bar patron scanned the coaster or poster using the Blippar app, a Tetris-style interactive game appeared on their phone. In the game, users drop pub items on a scale and try to maintain balance based on where you drop it, playing off PFM themes about finding financial balance in your life. Every week, ATB awarded $100 to the user with the top score. The contest has ended, but the game is still live here. For Farmers Bank & Trust, getting employees to be active users of Clarity was vital to its success. Employees were encouraged to have their own personal success story and used word of mouth to help spread the good news about the tool. Schwartz, for example, used Clarity to understand how to pay off her student loan debt in seven years, whereas before, had never created a budget for the cause. Employees like Kevin Avery, a branch manager at Farmers Bank & Trust, actively share their PFM experiences with customers in branches. Not only were frontline staff better equipped to demonstrate the Clarity PFM tool, they even wore buttons that said if the employee didn’t talk to each customer about Clarity, the bank would pay the customer a dollar. In May of 2015, the bank ran a sweepstakes that gave customers an entry every time they logged in to their account or added an external account, giving away iTunes cards, an iPad and other prizes. The bank had an increase of 323 users, 1,200 logins and 30 external accounts added during the contest. Sicily Axton is the communications manager for StrategyCorps, a Nashville-based company that works with financial institutions nationwide to deliver mobile and online consumer checking solutions that enhance customer engagement and increase fee income. You can follow Sicily on Twitter and connect with her on LinkedIn. This article was originally published on July 29, 2015 . All content © 2019 by The Financial Brand and may not be reproduced by any means without permission.